Wood carvings by David Frykman. This year woodcarver David Frykman has been busy carving the reclaimed wood from the former Eagle Tower that stood in Peninsula State Park from the 1930s until 2015. Nature photographer Heather Frykman visited David’s workshop and captured pictures as he created a few more items, such as cardinal and eagle ornaments. Peninsula State Park’s Eagle Tower had to be taken down in 2016 and is currently being rebuilt, with a projected completion date set for 2019. 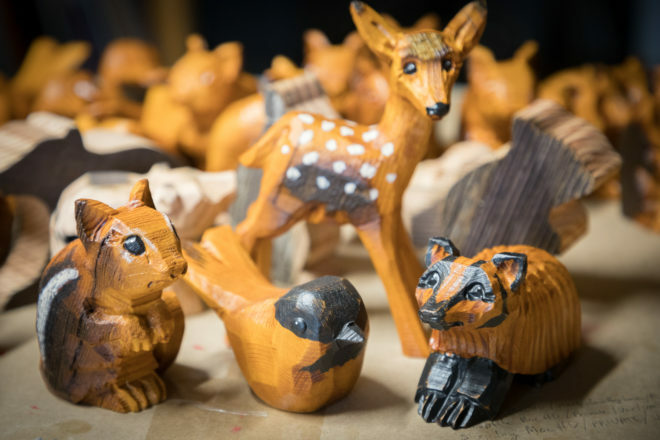 As cold weather approaches, David will close down his unheated carving studio for the winter months, but Frykman Studio Gallery will still have a selection of David’s Eagle Tower woodcarvings available. To view the Eagle Tower woodcarvings, visit the gallery at 2566 S. Bay Shore Drive in Sister Bay or FrykmanGallery.com.